My Basic Soup Recipe For Every Veggie Under The Sun and Soil! 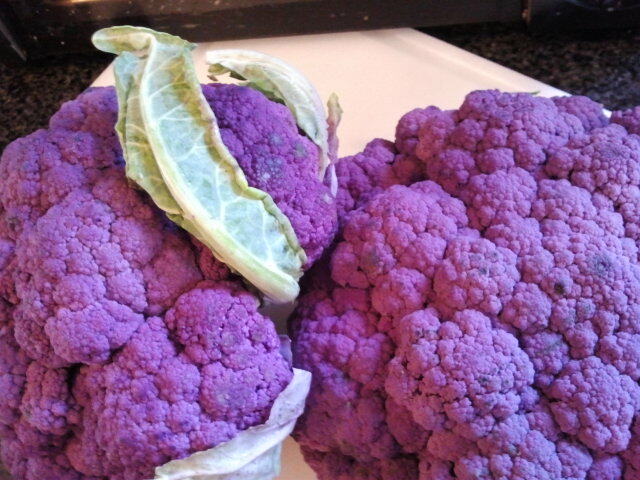 Cauliflower (purple or otherwise!) is an excellent base for this soup, but I make essentially this recipe with carrots, courgette/zucchini, squash and pumpkin, broccoli, turnips, etc etc etc. This recipe can be stripped down to the basics for GAPS Intro by omitting spices you haven't tested yet as well as the coconut milk or cream. 1 tablespoon oil of your choice (I love using beef tallow skimmed from the top of my bone broth. In a large stock pot, heat the oil over medium heat. Add the onions and cook, stirring, until soft, about 3 minutes. Add the garlic and cook for 30 seconds before adding the curry powder, salt, and cayenne. Stir, and cook until fragrant, about 30 seconds. Add the cauliflower, reduce to medium heat, and cook, stirring occasionally, until soft, 5 to 6 minutes. Add the broth and bring to a boil. Reduce the heat and simmer until the veggies are very tender, about 30 minutes or more. Remove from the heat. Puree the soup. Return to medium heat and stir in the coconut milk if making a curry. Simmer for 3 minutes. Adjust the seasoning, to taste. This basic recipe freezes very well with the coconut or not. Add your slightly precooked grass fed meats, and you have the closest thing to a meal on the go that you get on GAPS during the intro or any other phase! I made this the other night with white turnips and oven-roasted fennel, and it was one of the most delicious soups i have ever ever eaten! A delicious, warm spicy soup with a bit of sweetness that will still heal and seal your gut! 5-6 cups bone broth (I went with beef, but chicken would work fine, or even veggie) Only use enough to just cover the fruit and veggies in the pot for a richer creamier soup. Preheat oven to 400 degrees. Cut butternut squash into quarters. Scrape out seeds and pulp, coat in roughly half of the oil, and roast for about 20 minutes while preparing the rest of the recipe. Set a large cook pot or dutch oven over medium heat and heat the remaining oil for 1-2 minutes. Do not brown it. Sauté the onion in he oil for about 5 minutes. Peel (you can use a potato peeler) the squash once roasted and cooled. Then dice. The smaller you cut up your in ingredients, the faster they'll cook. Add squash, apple, pumpkin, and broth to the pot. Bring to a rollicking boil. Add spices and stir well. 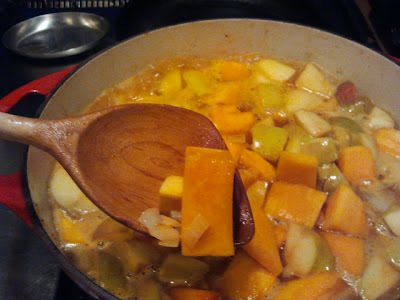 Cover and simmer and for 30-60 minutes or until squash and apples soften. Puree thoroughly once everything is soft. Add salt and spices to taste, and garnish with chives or parsley. Enjoy for a few days and/or freeze for later. This soup should be nice and thick, almost creamy. In search of a little treat, I cruised my pinterest boards for food inspiration, and came up with this recipe after drooling over the Pale Parents' Banana Pumpkin Pucks! I didn't have any coconut flour, but I did have some leftover almond pulp still in the freezer from our nut-milk making party a while back. You'll have to play around yourself as almond flours and meals vary greatly. In hindsight, I might add an egg yolk or two next time I make this for a more bread-like result. In the end, you may have something pretty gooey and a little fragile, but the taste is fantastic! Combine pumpkin, bananas, dates, applesauce, vanilla and liquid coconut oil In a food processor and blend until very smooth- could be a few minutes. Next, add dry ingredients to food processor and pulse until well-blended and doughy. Add more flour and/or coconut shreds if too sticky. 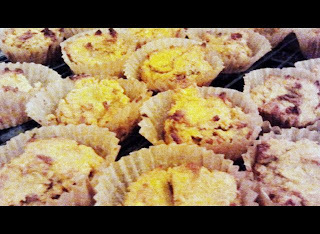 Bake at 350 degrees for 30-40 minute. They'll have some browned edges and bounce back slightly to the touch. Cool on a rack, enjoy for a couple of days and freeze for later as well.